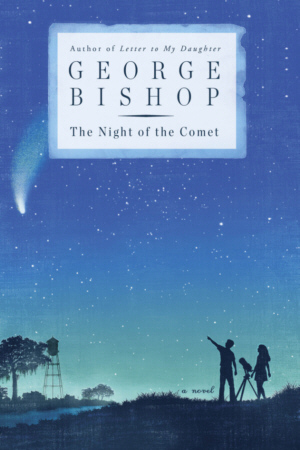 The Story Behind THE NIGHT OF THE COMET by George Bishop Jr.
Like the narrator of my novel The Night of the Comet, I grew up in a small town in Louisiana. Jackson, in East Feliciana Parish, had just a few thousand residents, no traffic lights, and a handful of shops on its main street. It also had none of the problems of light pollution that plague big cities: when it was nighttime in Jackson, you knew it was nighttime. For a boy growing up in a town like that, finding a sense of astonishment at the universe was as easy as opening the back door and stepping outside at night, where the stars were so close and abundant that you felt you might’ve knocked your head against one if you weren’t careful. Then, the extraordinary wasn’t something you had to go looking for; it was right there all around you. When I was teenager our family moved to Baton Rouge, a mid-sized city with the usual shopping malls and parking lots and twenty-four hour convenience stores. Although we had trees and a creek in our backyard, the I-10 freeway wasn’t far off, and the constant noise of traffic that seeped through our bedroom windows at night washed out the sound of crickets and bullfrogs. I remember the flare up of excitement that heralded the coming of Comet Kohoutek in 1973, but after it passed unseen over the city, any childhood fascination I might’ve had with the stars soon fizzled out. There were tests to study for, and girls to worry about, and the whole puzzling prospect of what to do with the rest of my life. After college I lived for the better part of a decade in Los Angeles, finding work as an actor in TV commercials and sitcoms. The city, as I remember it, had no real nighttime to speak of, just a hazy yellow glow that hung over the streets from dusk until dawn, obscuring the sky, and the only stars to be seen, if you were lucky, were the ones swishing by in the backs of limousines. When I left Los Angeles to go work overseas as an English teacher, I bounced around from continent to continent and city to city: Istanbul, Jakarta, Tokyo. I still caught glimpses of the constellations now and then, but like most people I was usually too busy with life on earth to bother much about lights in the sky any more—that is, until a few years ago when I ended up in Brattleboro, Vermont, at the School for International Training. The institute’s located on a dark hill outside of town. The air’s clear there, and at night, especially in winter, the sky is fairly bursting with stars. I happened to be working on my previous novel at the time, but for breaks I liked to walk out into the hills beyond the buildings, and as I got reacquainted with the stars, I remembered that particular sense of awe I’d felt as a boy back in Jackson. I became convinced that this feeling was something worth writing about. As we get older, gaining access to a sense of wonder at the universe may no longer be as easy as opening a door and stepping outside at night. We have to work harder to find our inspiration. But I also think that no matter how jaded we are, no matter how distracted we are by our daily affairs, an appreciation of the great mystery and miracle of life is always within reach. A couple of months ago we had a big storm here in New Orleans, Hurricane Isaac. It ripped down trees and power lines and knocked out the lights in most of the city. The weather was sweltering, and neighbors opened up their doors and windows and pulled chairs out onto long-neglected porches. At night it was profoundly quiet—no TVs, no air-conditioners, no traffic; just the sound of crickets and bullfrogs. It was also incredibly, beautifully dark. And there, high up above the battered palms, we all saw something marvelous and downright stunning, something that, to our amazement, must’ve been there all along: millions and millions of stars, a ridiculous profusion of them, shining everywhere you looked.